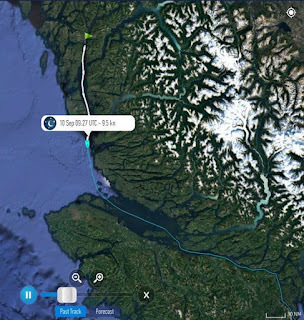 Three nights ago, the American ATB tanker "OneCure" passed through Seaforth Channel, and then quietly snuck by Bella Bella, and carried on southbound through Lama Pass, and on through Fitzhugh Channel, and onward down the BC Inside Passage. This is the very 1st trip by one of these American ATB's through the Central Coast Inside Passage since the wreck of the ATB "Nathan E Stewart" in Seaforth Channel nearly 2 years ago. 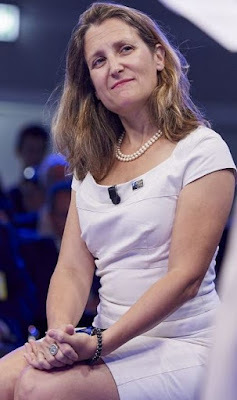 Since the NES disaster, American ATB's have been BANNED from plying Fitzhugh Channel, Dean Channel, Lama Pass, Seaforth Channel, Finlayson Channel, Princess Royal Channel and Grenville Channel by a decree ordered by Pacific Pilotage Authority CEO, Captain Kevin Obermeyer. Instead, they are now required to travel via Hecate Strait. Apparently the "OneCure" found the rather ordinary September Hecate Strait gale conditions a tad uncomfortable 3 nights ago, and sought permission from Obermeyer's office to travel inside instead. And happily the good Captain's "Director of Marine Operations" granted that permission according to their "Standard of Care document." So this begs the question, what if the Captain of a fully loaded 10,000 deadweight ton-capacity ATB tanker is on its way to Alaska and runs into a gale, will Captain Obermeyer's "Standard of Care document" now also allow it to enter these waters? Can we now, once again, expect to see loaded, or unloaded American ATB's passing to-and-fro in front of Bella Bella every two weeks, once again?? It should be noted that the "OneCure" is an identical sistership to the ATB "Jake Shearer" -even equipped with the same PROVEN FAILED TECHNOLOGY (Articouple Locking Pins) which caused the Shearer to tear loose from its fully loaded petroleum barge (3.5 million gallons of diesel and regular unleaded) -which then drifted to within a stones throw of the Goose Islands just last November. Hello Kevin, can you explain why the ATB "OneCure" passed southbound through the Inside Passage last night? 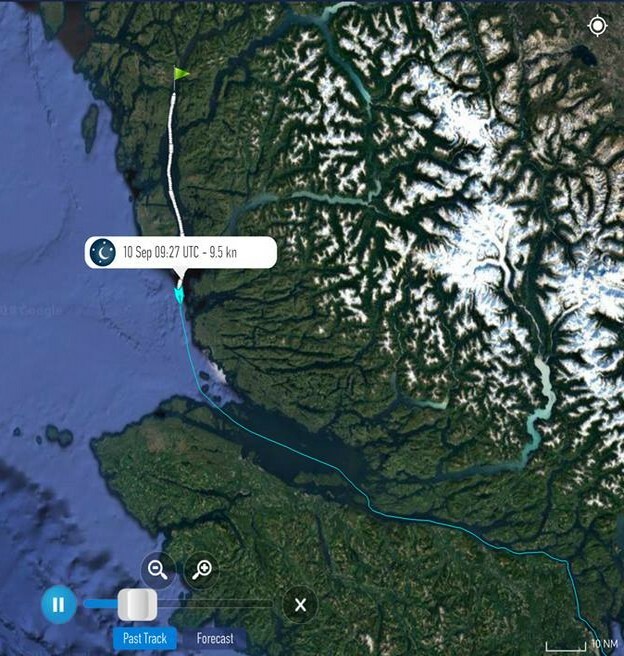 By the time I was notified, my tracker only goes back far enough to show it at Pointer Island at the junction of Lama Pass and Fitzhugh Channel, but people have reported seeing it go by Bella Bella. All these areas have been decreed off-limits to ATB's by your order. It is greatly concerning that this sistership of the "Jake Shearer," -which is equipped with the same proven-failed technology (ie their "Articouple" locking pins which failed on the Shearer in rather ordinary Hecate Strait weather last November) is risking these waters once again. It was southbound in ballast (no petroleum products onboard) and requested the deviation due to weather. It was approved by my Director of Marine Operations based on the fact that the barge was empty. This is allowed under the Standard of Care document. Well if your "Standard of Care document" allows this, then I expect the American ATB's will now make it a habit, as they do every trip with their "at the Captain's discretion" option to duck into Laredo. Can we also now expect your "Director of Marine Operations" to start allowing loaded ATB's into these waterways whenever they run into heavy weather as well?! Now every ATB trip goes through Laredo, which is not in the spirit of your decree. Being "empty" is no excuse. As you well know, the "Nathan E Stewart" was also "empty." Please instruct your Director of Marine Operations to refuse such requests immediately and forthwith.